Get away from reality. W Retreat & Spa – Maldives is a tropical playground in the Indian Ocean that’s perfect for relaxing, playing, and recharging for your next adventure. Connect with inner peace and go along with the pace of island life. Succumb to an inviting concept of dazzling blue waters, spectacular reefs and pristine sands infused with style and soul – you’re no longer part of the everyday. The W Retreat And Spa Maldives is located on Fesdu Island in North Ari Atoll, 72 kilometers southwest of the Malé International Airport. Slip into something comfortable in 78 private retreats, from the beachfront Beach Oasis retreats to the Ocean Oasis retreats perched above a crystal clear lagoon. 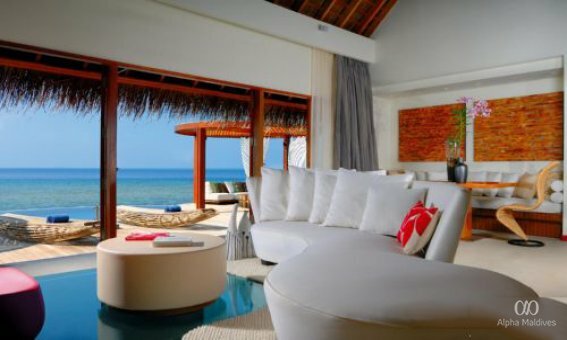 The Seascape Escape suites are designed for amplified luxury, and the Ocean Haven suite is the ultimate island getaway. Bask in the designer simplicity of this bi-level beach villa in Maldives. 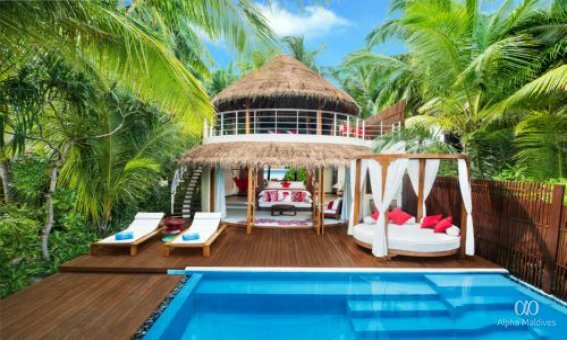 A spacious outdoor lower deck (118 square meters) covers all the custom amenities of absolute tropical luxury, starting with a plunge pool and a circular daybed, nestled within absolute privacy. Dipping in the crystal clear Indian Ocean or running your toes through pristine white sands is just moments away from your doorstep. Stay indoors forever with the 42” plasma TV, BOSE® sound system, complimentary High Speed Internet Access, king-sized signature W bed, wine fridge and delightful Munchie Box. Bathe under blue skies or bright stars in the open roof bath area with standalone bathtub, rainforest shower and Bliss® Spa bath amenities. Upstairs, a swing daybed, fridge and BBQ area beckon in hideaway living space, complete with unobstructed sweeping views of the coast and soothing sea breezes. Keep everyone together with interconnecting twin rooms. Spy on the island’s marine life in this over-water one-bedroom Maldives ocean villa perched above a transparent lagoon – do it all from the privacy of your plunge pool, your sundeck, or through the glass bottom floor. Get in and stay connected with the 42” plasma TV, BOSE® sound system and complimentary High Speed Internet Access, even though you’re miles from everywhere. Flip a switch so underwater lights illuminate the aqua landscape beneath the living room’s glass floors – watch what comes alive at night. Another great after-dark scene: the king-sized signature W bed, where sweet dreams happen. Unwind to the ultimate degree in this two-bedroom suite that stretches over water, a private playground of serenity and never-ending ocean views. 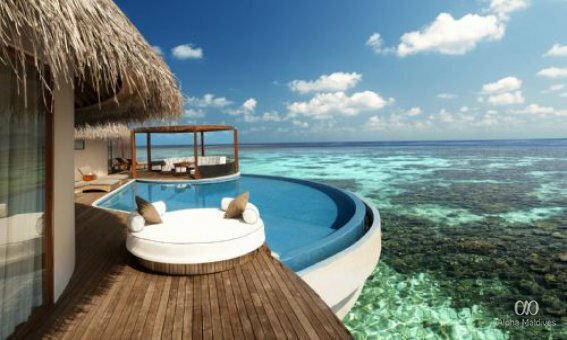 These luxury water villas in Maldives will never let you run out of room to wander, lounge, revel and relax with a super-spacious sundeck, where an oversized infinity plunge pool and sophisticated design elements surprise in style at every turn. Spend all day swimming or snorkelling in the gorgeous lagoon with direct access just down the steps from your deck. Catch your breath with a siesta on the daybed, also a perfect spot for stargazing all night long. Grill up a feast on the barbeque, and indulge on the freshest catch of the day with a fine vintage from the wine fridge while kicking back at the indoor/outdoor living space with comfy couches and a dining area. A refreshment centre, powder room and glass floor complete the vibrant setting. Drift away to dreamland in the master suite’s king-sized signature W bed with spectacular views of the horizon and a 50” plasma TV in the sitting area. In the junior suite with its own bathroom and entertainment area with 43” LCD TV, snuggle up in twin signature W beds. Discover an around-the-clock culinary experience created with soul-satisfying food and complemented by ambiance and simplicity at KITCHEN, our all day dining restaurant in Maldives, a unique and modern reinvention of the bistro. Get ready for surprising, one-of-a-kind twists on simple dishes you know and love, as only served in our KITCHEN, while open cooking stations lets you keep an eye on all the action. Casual elegance, clean lines and unforgettable sunset views takes dining to a whole new radiant level, or cozy up in a semi-private niche. A wine safe keeps your favourite vintages fresh. Get close to nature and go barefoot at our tables nestled among palm trees under the stars – FIRE is where free spirits can indulge in casual outdoor dining in Maldives, feasting on barbeque and reconnecting with nature. Dig into spit-roasted lamb or suckling pig at the barbeque or choose from a selection of quality meats and fresh local seafood to pleasure your palate. An open tandoor oven presents naan bread, marinated chicken, fish or seafood accompanied by a variety of curry dishes and traditional condiments. Food lovers will indulge in a culinary experience at FISH, the newly restyled overwater signature seafood restaurant in Maldives setting the trend of what’s new and next in the gourmet scene. Featuring “Ocean to table” cuisine concept with a strong focus on the freshness of local ingredients from the sea, this specialty venue is a must for a unforgettable outdoor romance dinner. With breathtaking views of the Indian Ocean, every table is the best seat in the house to taste fish from the surrounding reefs or international selections transformed into delicacies flirting with Asian sensibilities. Mix it up. Hang out. Let your hair down. Our sunset lounge on the southwest end of the island is pulsating outdoor bar in Maldives that completes any fabulous day with a breathtaking sunset view, breezes off the Indian Ocean and a soothing rhythm of the lapping waves. All of this paired with freshly prepared oysters, sushi, caviar and an extensive wine and champagne list. You wouldn’t want to be anywhere else. Mingle in the golden sunshine under blue skies or start your night on the right note with chilled beats and a spectacular starlit sky, as signature cocktails by our mixologists turns anytime you’re here into a celebration of vibrant fun over water. Glide up to our part pool bar at WET® pool, part poolside gourmet lounge where you can mix it up with our signature cocktails, light main courses, wood-fired pizzas, delicious burgers, bountiful salads, delectable Asian cuisine and sweet treats – without leaving the cool of the water. There are no other bars in Maldives you would rather be! Bask in the glow of special fibre optic illumination that dazzles the poolside area in a vibrant display of lights – that starry sky above will seem even closer than ever! Choose the venue, we'll do the rest - Dine on pristine coral terrace to the sounds of the Indian Ocean lapping on the shore around you or stay home and we'll bring your choice of menu to you and serve you in the comfort of your retreat. Melt tired muscles with an over-water massage. Each of these massage techniques has its own virtue, its own response to your body's needs and to your state of mind. Need to reclaim mind-balance? Seek a consultation with the specially trained therapist’s for a personalized ayurvedic program according your to own ‘dosha’. Experience selected therapies to detoxify the body, harmonize the mind and calm the spirit. Our wraps and scrubs are designed to increase metabolism, detoxification, remineralization and hydration, stimulating your body's systems. Enhance your experience with an après treatment steam, shower, bath or massage. Enhance your skin's natural beauty with a perfectly personalized facial. The signature Sublime Comfort Facial goes beyond simple cleansing with pure precious essential oils, immense oxygenation and 30 minutes of facial acupressure and massage. Indulge in ultimate relaxation at the over-water AWAY® Spa. 66 square meters of indoor and outdoor treatment areas allow for total privacy and complete renewal. Dedicate some time to your well-being and comfort with a natural healing therapy performed in one of 4 luxurious treatment villas. Stretch to the clear blue skies and breathe in the fresh sea air. Yoga is practiced on the floating teak-lined platform surrounded by spectacular sea views. Popular Pavilion pastimes include painting, contemplation and revitalization. Get all wrapped up in a delightfully intense super-spa experience. A series of experiences build on each other to reduce stress, heal the body, boost spirits and refresh your outlook, leaving you energized, balanced and harmonious. Explore and express yourself with painting sessions. Each brushstroke brings with it intellectual, creative and spiritual development. Ayurvedic SUNDÃRI skin care products utilize the powerful regenerative properties of plants, herbs, roots and essential oils and floral extracts to improve the complexion and appearance of your skin. Leave everything to us, and you’ll walk out of our signature destination spa experience with a new energy. Reflecting the W style, the Acceleration and Deceleration facilities at W Maldives are the absolute latest, offering our guests plenty of things to do in the Maldives. Accelerate at FIT, a state of the art fitness centre where energizing is easy. Then there’s the beach water sports and DOWN UNDER® dive centre. Alternatively, decelerate. Research escapism and discover true pampering at the AWAY® Spa. Satiate your deepest innermost scuba diving cravings at our prominent diving resort in Maldives. After exploring Maldives’ stunning landscape and azure waters, discover life beneath the surface and see a whole new world. Oozing with diversity and magnificent reefs, each dive will be unique and provide you with memories to last a lifetime. Experience the most popular diving sites you can find in Maldives by traveling on one of our liveaboard boats or by simply scuba diving in the neighboring house reefs. The liveaboard boats come fully equipped with diving gear, sports equipment, and professionally trained staff. So you can mingle and safely enjoy with some of the richest marine life in the world as you swim along with mantas, turtles, reef sharks, dolphins, and the biggest fish on earth - whale shark. The abundance of underwater caves, caverns, and overhangs ensures your dives are nothing short of a spectacle. Explore some of the world’s best dive sites right on the doorstep of W Maldives : Maaya Thila, Fishhead, Malhoss Thila, Himendhoo Thila - to name just a few. Get certified with a full range of Diving Courses : Open Water, Advanced Open Water, Rescue Diver and Divemaster. Specialty courses such as wreck, nitrox, underwater photography, night or deep. Water sports in the Maldives are among the best in the world. If you are looking for a place where you are surrounded with turquoise waters and waves fuelled with energy, then it’s time to grab your fins and head to WAVE – our in house water sports centre. Go windsurfing and enjoy the seaside winds over the turquoise clear waters. Explore the waters surrounding the resort or venture to the nearby uninhabited islands with a guided jet-ski tour on our Wave Runner Jet Ski. See a spot that you’d like to explore? Hop off your jet-ski and dive in to the water, it’s all waiting for you. The ultimate romantic dinner just got hotter. You choose the venue, we'll do the rest! Indulge exclusively in the Maldivian Paradise – from private setting of our fine restaurants and beaches to the neighbouring Gaathfhushi island, dine comfortably whenever, wherever with your loved one. Iconic Settings.Dine on our pristine coral terrace to the sounds of the Indian Ocean lapping on the shore around you or stay home and we'll bring your choice of menu to you and serve you in the comfort of your retreat. Want to whip up your own dinner instead? Join our personalised cooking class with our chefs and prepare some amazing Maldivian dishes or grilled seafood straight from the ocean.